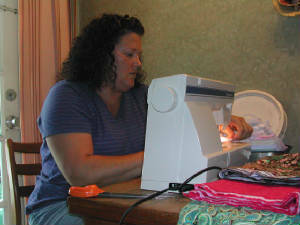 Yes, I make it ALL! 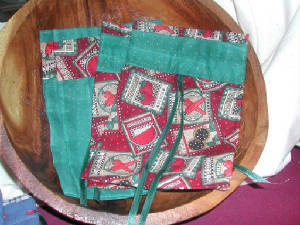 You get your choice of a cloth giftbag that will fit the soaps and a little bit more, if you choose. One bar of our all natural soaps, the Lime and Pine Shaving/Shower soap and Cabin Fever--both nice guy scents!! Or tell me in the comments area if you have another choice!! 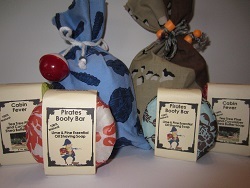 You get your choice of a cloth giftbag that will fit the soaps and a little bit more, if you choose. 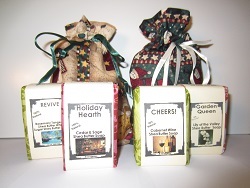 And any two of our wonderful Shea Butter Soaps--your choice or if you don't specify in the comments area I will pick two!! These are traditional lavender sachets with real flower petals filling a cute little cloth bag with a flower stenciled on each bag. 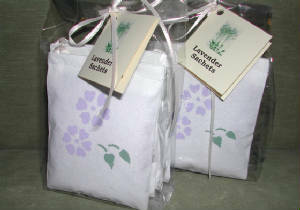 Lavender sachets have a purple flower, Rose have a pink flower and the Chamomile sachets have a yellow flower. Now packaged in a clear cello bag with ribbon and hangtag! machine. Please visit any of the links below for that special giftbag. 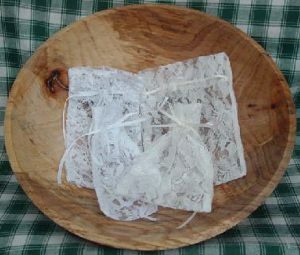 These are the lace bags I used to display the soap in years ago. I have them in white and ivory but only while supplies last. They are generally big enough for a single bar of soap but as I make them from scratch, sizes do vary. If you need them for a particular use, let me know!